An upscale express cruiser finished in neutral colours with gorgeous cherry wood accents. 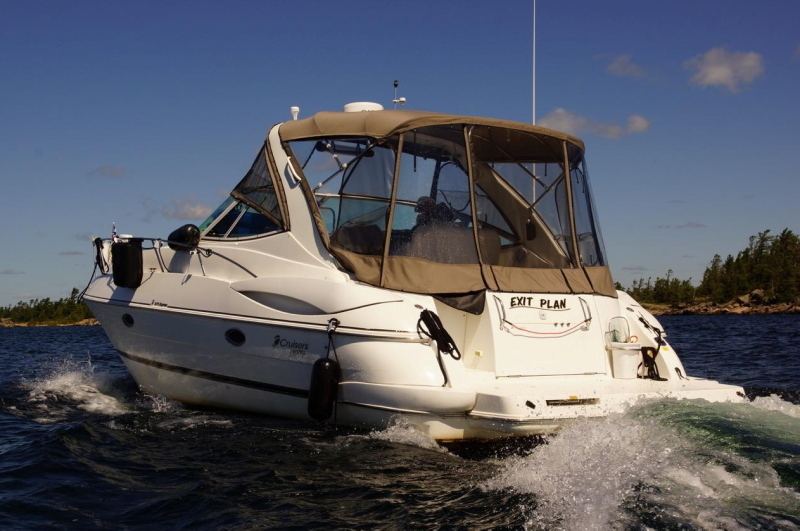 The large swim platform and walk-thru windshield provide easy, safe access from stem to stern. Below decks, the cabin is open and inviting with a mid cabin dinette and a comfortable leather lounge to starboard. The bi-level cockpit features a large U-shaped aft lounge and a wet bar with refrigerator for refreshments on the go. The head compartment is generous for a mid cabin layout, with a separate shower stall and plenty of room to move about. Overall, a great design inside and out, coupled with Cruiser’s dedication to modern production standards and techniques. This 3470 Express is fully equipped for extended cruising with new electronics, a factory generator, heat/air, all chain windlass, extensive battery power and a bow thruster … a very rare option on a 34’ boat! The large swim platform and walk-thru windshield provide easy, safe access from stem to stern. A superb layout inside and out!